Coach George Powles speaks with McClymonds High School basketball players Frank Robinson and Brady Hord. January 8, 1953. 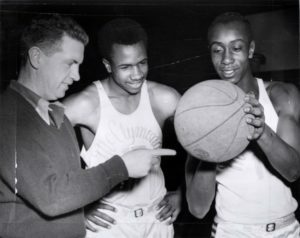 Legendary McClymonds High School coach George Powles provided some last minute tips to two of his players, Frank Robinson and Brady Hord, before a championship basketball game against Fremont High in January, 1953. 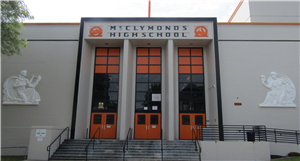 McClymonds, a small school in then blue collar West Oakland, was known as "The School of Champions," and for good reason. In the post-World War II years, Powles' teams, as well as other teams representing the school, won numerous championships. 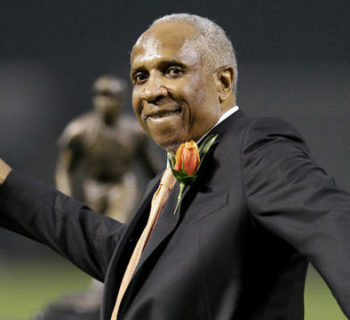 Powles, who coached basketball and baseball at McClymonds, as well as youth baseball in the American Legion and Connie Mack programs, was mentor to a number of students. As adults, Powles' students would confront life with the focus and determination that he had taught them. Although they were from a single Oakland neighborhood, they would help change the world of professional sports forever. Robinson was one of those students. The leading scorer on the 1953 Warrior basketball team, Robinson would later become a Hall of Fame baseball player. 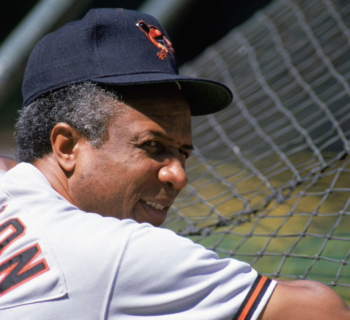 He was the first major leaguer to be Most Valuable Player in both the National and American Leagues, and baseball's first African American manager. A teammate on the 1952 McClymonds basketball team was Hall of Fame basketball player Bill Russell, who later would become the first African American to coach an NBA team, the Boston Celtics. Russell is the subject of additional material on this website. Powles' 1953 McClymonds baseball team featured Robinson, as well as future major league stars Vada Pinson and Curt Flood. Pinson was a two-time All-Star and a solid major league outfielder for 18 seasons. Like Robinson, Flood would become an enormously important figure in professional baseball, beyond his status as an All-Star center fielder. His courageous fight against baseball's reserve clause, which bound a player to a team until the player was either traded or released, set the stage for player free agency and the enormous salaries enjoyed by athletes today. Today, Robinson and Russell are looked upon as athletic legends. Both are considered to be among a small group of the best players in the history of their sports. Both also are admired for breaking through barriers that had excluded African Americans from professional coaching ranks. However, Flood has both suffered and prospered in the court of American public opinion. 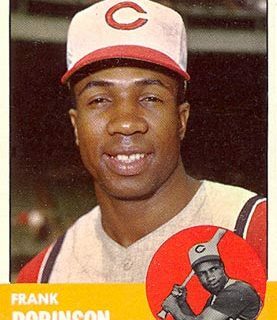 When he filed suit against Major League Baseball in early 1970, the nation was astounded. Flood charged baseball with violation of anti-trust laws and of his 13th amendment rights. He contended that the clause denied him the right to work for whomever he pleased and suppressed player salaries. Flood ultimately lost his case before the U.S. Supreme Court. The decision was seen by many observers more as a decision for baseball, (which had always enjoyed a favored status with the court), rather than a ruling against Flood's case. Baseball leadership, however, was forced to recognize that the world was changing in terms of team-player relations. Flood's suit set forces into motion which would culminate in an arbitrator three years later, striking down the reserve clause, quickly transforming baseball salaries from thousands into millions. Having retired, Flood did not benefit from the decision. "I lost money, coaching jobs, a shot at the Hall of Fame," he said of the consequences of his legal challenge. "But when you weigh that against all the things that are really and truly important, things that are deep inside you, then I've been successful."